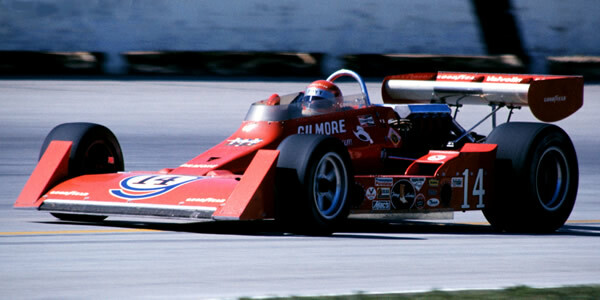 AJ Foyt took further advantage of USAC's boost rules in 1975 and his Coyote, the sole car powered by the Ford-designed quad cam engine, dominated the season. McLaren built a further evolution of their M16 series, the M16E being driven by Johnny Rutherford to second place in the title race - again - but no new Eagles were built for 1975 and this started a rethink in many team owners' minds about building their own cars. Lindsey Hopkins had already built his own car in 1974, another Bob Riley design on similar lines to the Coyote, but the Silver Floss Sauerkraut Special did not prove competitive. Despite this, George Bignotti at Patrick Racing asked Riley to build a third Indy design, to be known as the Wildcat Mk I, for regular drivers Gordon Johncock and Wally Dallenbach. It was equipped with the new Bignotti-inspired DGS engine, an evolution of the ancient Offy turbo. Parnelli had moved up to Formula 1 but were running a 1974 Eagle for Al Unser and also exploring their own new engine, a turbo-charged version of the Formula 1 Cosworth DFV. Unser gave this engine its debut in the back of a new Parnelli VPJ6 before the end of the season. Also running competitive cars in 1975 were Penske (Norton Spirit McLarens), AAR (Jorgensen Steel Eagles), Jerry O'Connell (Sugaripe Prune Eagles) and Bob Fletcher (Cobre Tire Eagles); all using 1974 cars.